FARCE. After the treasurer steals the town of Rosewell’s money, the mayor gathers the citizens together and gives them two options: A.) Raise taxes by 10,000% or B.) Come up with another plan to raise money. The residents overwhelmingly vote for plan B, but they have difficulty thinking up ways to raise money beyond hosting $200 carwashes or $600/plate spaghetti dinners. 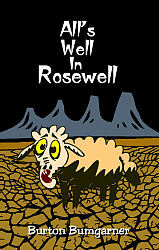 For inspiration, the citizens look to their prosperous desert neighbor of Roswell, NM, and realize that the only differences between Roswell and Rosewell is that Rosewell has an extra “E” and Roswell has aliens! Wanting to cash in on the alien craze and attract tourists to their town, the Rosewell citizens scatter pieces of a broken-down 1991 Yugo across the desert and then wait for the government to haul off the Yugo parts to a secret storage bunker and deny its existence. But all the extraterrestrial hoopla draws some unexpected guests to the town including a UFO enthusiast, a mob boss, two dimwitted hit women, a tabloid reporter, a Texas Ranger—and a real alien (or two)! Burton Bumgarner is an award-winning playwright who has published more than 60 plays. Mr. Bumgarner has experience as a director and a sound and light technician. Mr. Bumgarner resides in North Carolina, where he works as a professional musician.